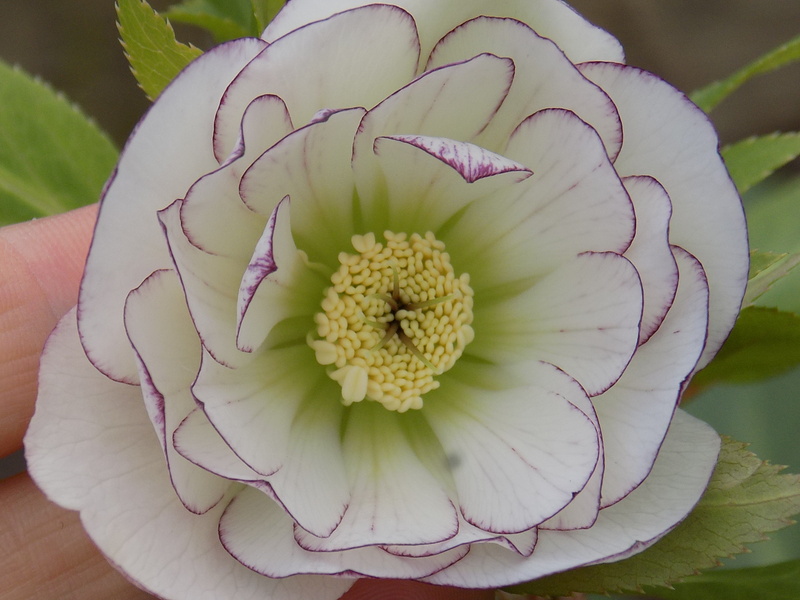 I feel like I am always raving about the benefits of Hellebores in the cutting garden. They are such a welcome flower in the depths of winter and throughout spring. If they freeze, they just thaw out again, undamaged. 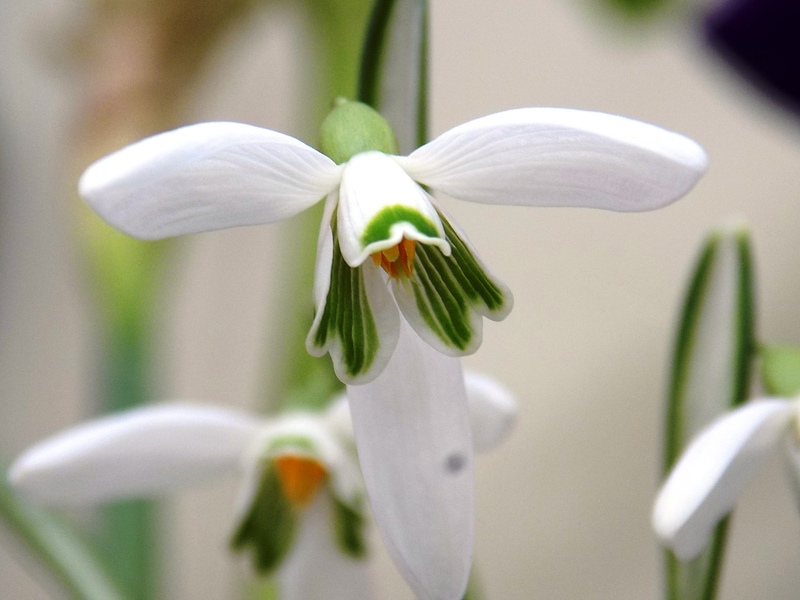 They're an important source of early nectar for pollinating insects and they reward you with stunningly beautiful flowers which can form the focal point of arrangements from January through into April. But, (sorry!) they can be temperamental as a cut flower. You can't cut them whilst in bud, like most flowers, you need to wait for them to have been fully open for a few days. You can even wait until they start forming green seed pods in the centre. These pollinated flowers do last much longer in the vase but the flower colour does alter as the flowers age. I cut them young, straight into water. I slit the stems at the bottom and if they do wilt overnight, despite this preparation, I find that re-cutting the stems and searing the ends with freshly boiled water can rejuvenate them. If that doesn't work you can always dispense with the stem and float the flower heads in a large, shallow bowl. Or you could if you don't have a cat (Florence, you know who you are..) that likes to drink water out of any vessel other than her water bowl! Hellebores with cat hairs aren't so attractive. 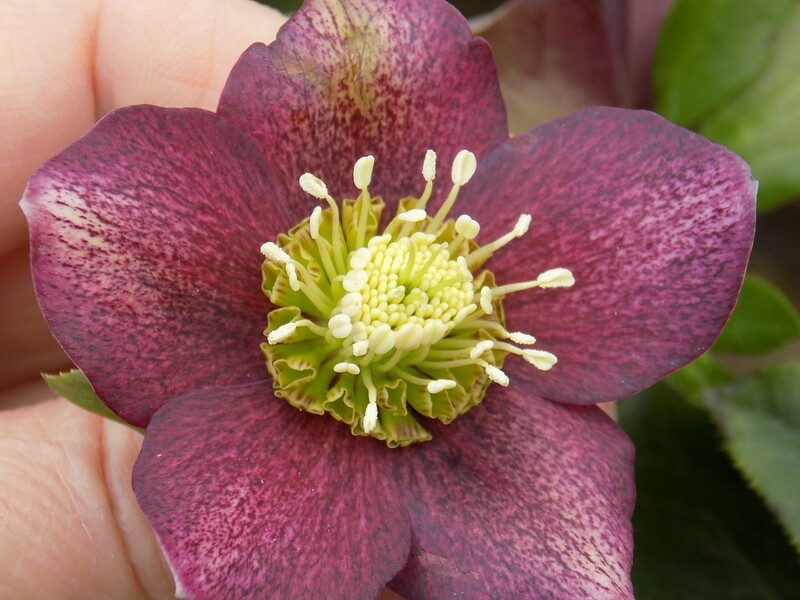 The reason for focussing on hellebores in this post is that I have been treated to an early Mother's Day present of some new hellebores to plant out in the cutting garden. I am planting them in the dahlia and tulip bed where I am hoping they will enjoy the shade cast by the dahlias during the summer but will be free of towering dahlias from late autumn, all through winter and spring. Hopefully they will enjoy this mix of sun and shade as much as I enjoy their flowers. Rain, lots of rain. Good for the garden, if not the spirits. March heralds the official start of spring and it's also the month to start sowing seeds. A rewarding task, especially if you can do it inside in the dry. I have a small potting shed for the actual seed sowing but I move the pots inside onto my sunny windowsills so that they get the heat required for germination. So far I've sown sweetpeas, calendula 'Orange Flash', larkspur and a mix of colours of cornflowers. I'll sow more hardy annuals over the next few weeks. The cutting beds are full of emerging bulbs and I've been cutting some spring flowers to make tiny spring posies. 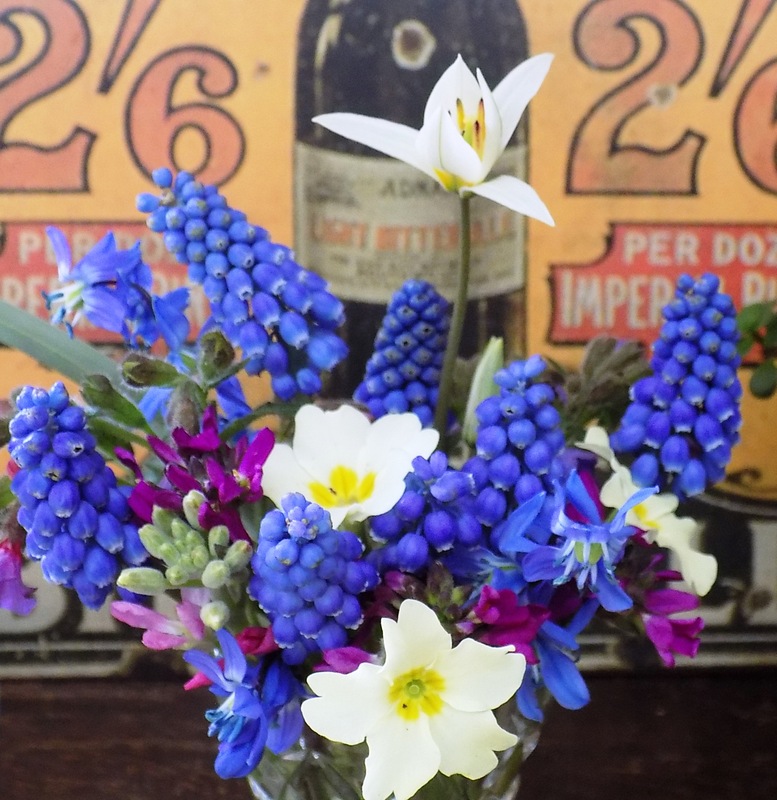 Grape hyacinths make wonderful cut flowers- having a surprisingly long stem and a delicate scent. I grow the bog -standard blue form and also dark blue Muscari latifolium which has just 2 sheaf-like leaves rather than the sprawling leaves of the common form. Another well-behaved grape hyacinth is 'Siberian Tiger', a white form which isn't as invasive. Baby's breath is a gorgeous pale, powder-blue variety (pictured above). 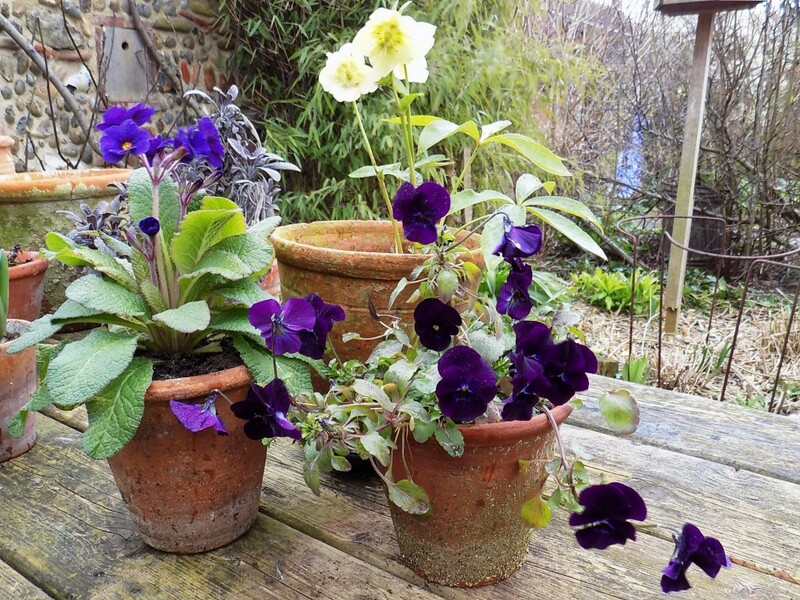 Other flowers for picking this month include daffodils, primroses, scillas, species tulips and pulmonaria. Pulmonaria is a great spring flower to tuck under a hedge or in a shady spot. 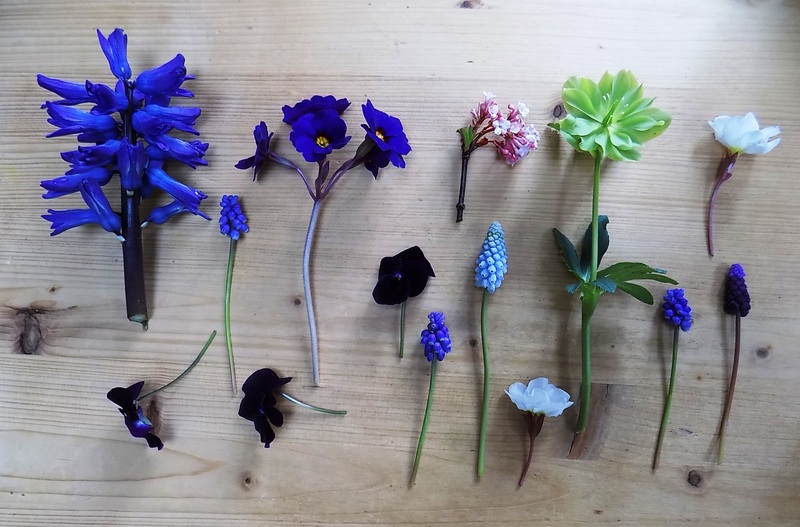 Its blue and pink flowers work well in a tiny spring posy. My dark purple trailing pansy has been flowering ever since October when I bought it from Beth Chatto's garden nursery in Essex. Pansies aren't everyone's cup of tea but they do make great winter flowers and I think they look lovely displayed in a terracotta pot. We have a table in our courtyard which can be seen through the pation doors. It's an ideal spot for displaying pots of seasonal flowers and I aslo keep some pots of herbs on it (mint, tarragon and purple sage). 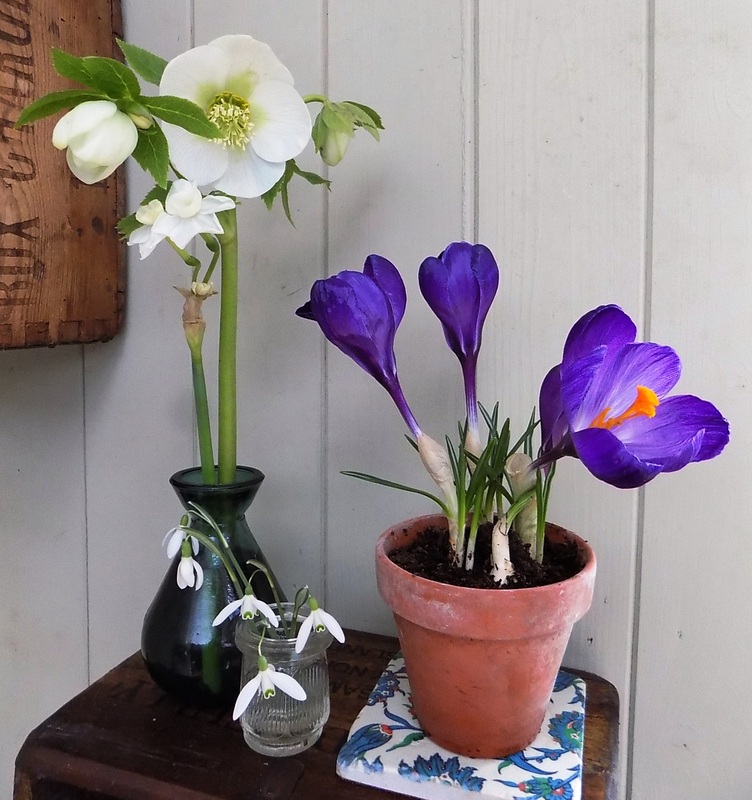 At the moment, we have pots of grape hyacinths, crocuses, a hellebore and a primula. Anything that is in flower at the right time can be displayed in a pot and then either planted out into the cutting garden or moved out of sight once it's past its best, ready for another year. Pots of flowers on our courtyard table. I hosted my first 'Grow Your Own Cut Flowers' workshop of 2019 and we had a dry, if very cold day, on which to pick our flowers from the garden. 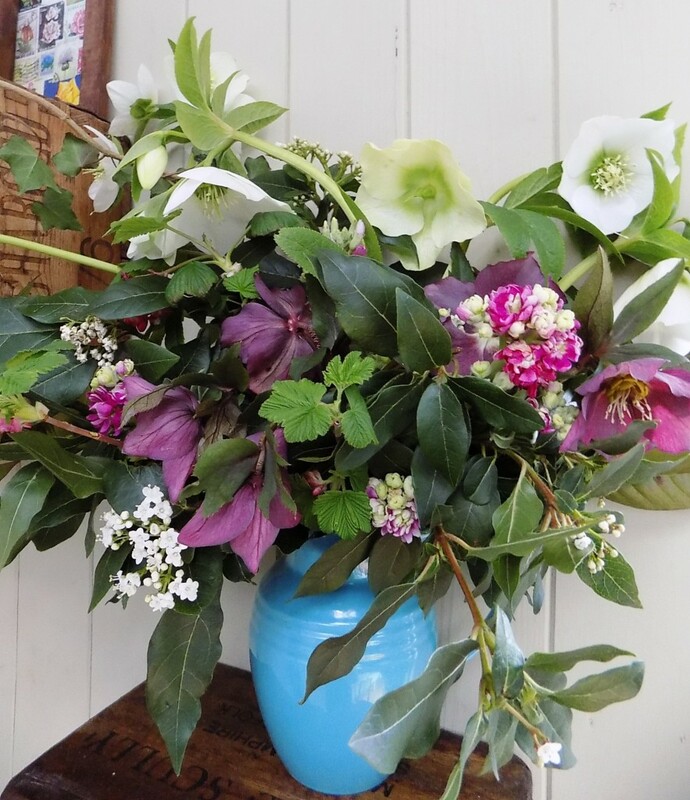 We picked and displayed white and dark red hellebores, Viburnum tinus for its white flowers and glossy green foliage, a few stems of flowering currant, some trailing stems of Trachelospermum jasminoides, rosemary in flower and some annual stocks which had survived all winter in the cutting garden. 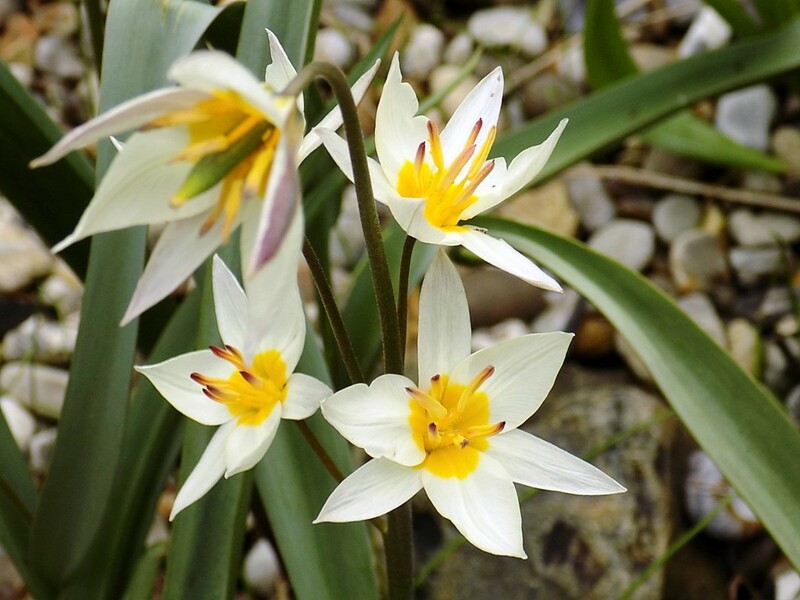 My student, Patsy wasn't keen on the idea of growing tulips as you have to put up with their rather unattractive foliage after flowering but I think I sold her on the idea of edging her cutting beds with the species tulip Tulipa turkestanica. 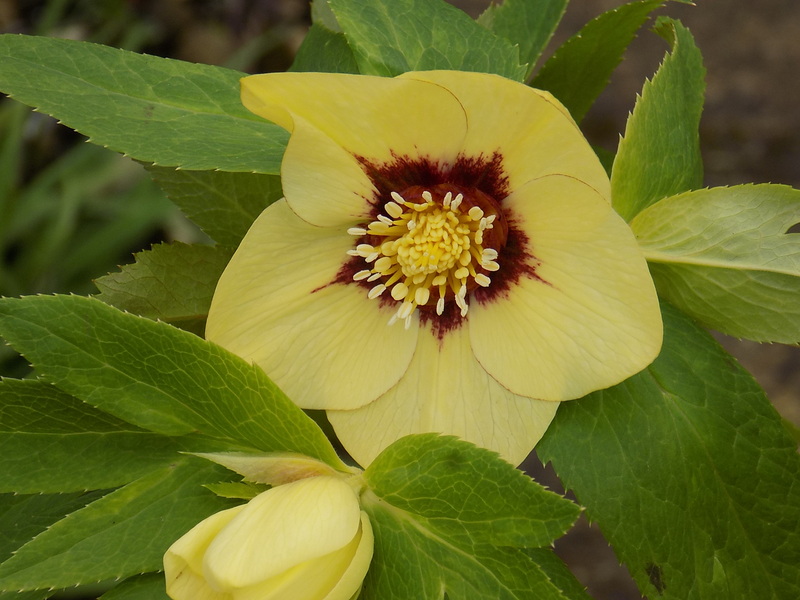 This variety has small, twisted leaves (which don't take up a lot of space) and beautiful pale yellow star-shaped flowers. If you leave some flower heads on, they form beautiful seed pods which are decorative in their own right. With record temperatures for February, we are making the most of the sunny days here in Norfolk. Spring really does seem to have come early with blossom appearing on our apricot tree and pulmonarias, grape hyacinths, daffodils and primroses all blooming early alongside the more traditional February fare of snowdrops, crocus and hellebores. I do have to keep reminding myself that the 'Beast from the East' struck in early March last year and we had so much snow that the shops ran out of milk and bread. There is a chance of the wintery weather returning so it's important not to go too mad and plant out anything frost-tender until later in the year. In the meantime, I will enjoy the early flowers, picking a few to bring inside for tiny spring posies and I'll finalise my plans for the annuals that I will grow this year. I plan to sow some sweet peas under cover this weekend and will start sowing some hardy annuals in a week or two, once March is underway. 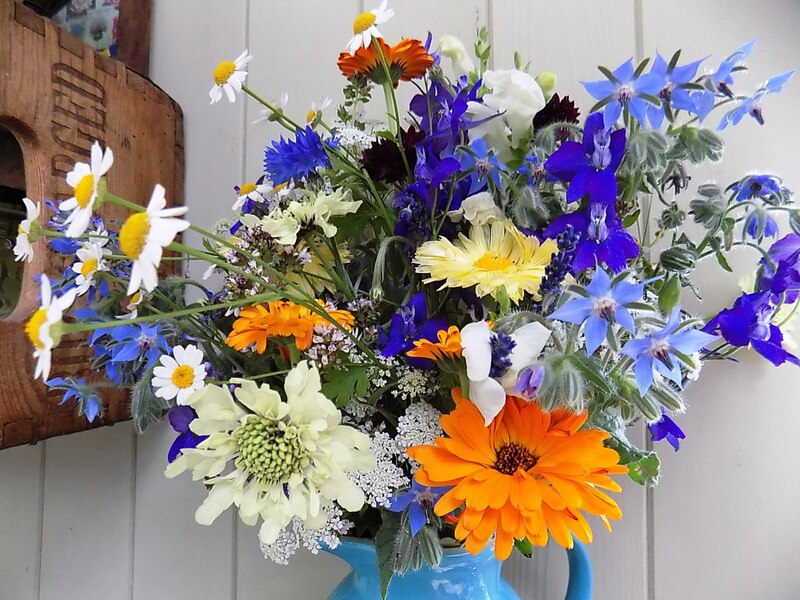 There are some annuals that I always grow - cornflowers, marigolds, sweet peas and scabious, but I might not choose the same colours or varieties to grow each year. In this way, each year is different and there will be something new and exciting to place in the vase.